If 'iconic' is the only word you can come up with to describe Nike's Air products, then don't feel too bad. We can't come up with anything else either. Trust us, we've tried. But then again, it doesn't get much better than 'iconic' status, does it? 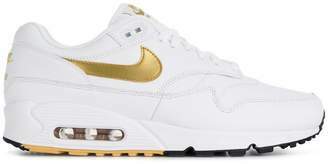 These white leather Nike Air Max 90/1 sneakers feature a round toe, a lace-up front fastening, a logo patch at the tongue, lightweight Air Max cushioning and a signature Nike swoosh to the sides.